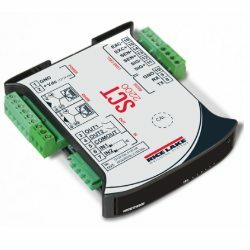 SCT-2200 load cell amplifier features HUB Mode connects up to 16 transmitters to one fieldbus. Quick menu for real and theoretical calibration. Red LED display with six-digits (8 mm) and six LEDs to showing active functions. Standard DIN rail mounting with power supply and enclosures. Configurable calibration and setup parameters from keyboard. In some industrial settings, customers actually prefer a SCT-2200 load cell signal conditioner instead of a bulky 920i digital weight indicator. These load cell amplifiers are popular with system integrators and plant maintenance managers who utilize weighing system applications integrated with a PLC or some other type of device. The SCT-2200 weight transmitter provides excitation voltage to the load cells, and can display more common signals like 0-10 VDC, 4-20mA, RS232, RS485, etc... Please see individual product specs for the proper version of load cell conditioner that's right for your application. These can be ideal for various settings including PLC, process control, batch weighing, check weighing, and more.